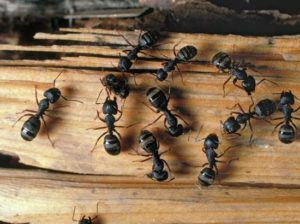 Carpenter Ants are common in several parts of the world. They are among the largest ants in the United States. As their name suggests Carpenter ants build their nests in damp or decaying wood. These ants live in both indoor and outdoor moist, dead, or hollow wood. In a forest environment, they are the most common ants. A typical carpenter ant colony has one queen who is also called the reproductive carpenter ant. After mating, the Carpenter ants reproductive i.e. the female carpenter ants begin their search for a new place to scatter the nests. Carpenters ants nest in warm and moist places. Carpenter ants are not hard to miss as they are large dark colored insects. They have bent antennas, and the adult ants have a pair of wings. Carpenter ants do not feed on wood like termites Instead, they make nests by cutting galleries in decaying wood. You can easily locate the carpenter ants by following the sawdust like trails and body of dead ants left behind by them. There are two types of carpenter ants colonies, namely parent colony and satellite colony. The parent nest is in outdoor places where carpenter ants take birth. Whereas, the satellite colonies are present indoors, made by the adult worker ants. These ants don’t feed on wood like termites, so the carpenter ants damage is not that severe. Carpenter ants are fans of damp, warm places around your home. The most likely entry point for them is where water and wood interact. They will come inside your house through these openings and work their way in – until they are settled around your windows, doorways, bathtubs, chimneys and other surfaces damaged by the water. As mentioned, carpenter ants do not feed on wood. They just use it as a cozy accommodation they dig their tunnels through. Nevertheless, they are still dangerous pests. If the infestation gets out of control, the stability and structure of your home may inevitably be ruined beyond reparation. Fats, proteins and sugar are the basic ingredients that carpenter ants find irresistible. That is why you need to make sure you don’t leave your or your pet’s food out too long, as you will provide them with an exquisite buffet they are not willing to miss. If you keep your firewood inside your house, you risk bringing some hitchhiker carpenter ants with it as well. In addition, if you have some plywood or other wood debris lying around your house, garage, or workshop, they will also attract these pests. This is especially the case if they get damp at some point. The first step to treating the carpenter ant problems is to find the old and new satellite colonies first and eliminate them. As we have mentioned above that carpenter ants reside in damp and decaying wood; it is time to locate their nest in your house. Carpenter ant nests inside the house in damp places such as badly sealed windows, behind bathroom tiles surrounding the bathtubs and sinks, inside hollow doors, under subfloor insulation, in attic beams, wooden porch supports, and columns. You should do routine checks around your house for old and moist wooden spots because carpenter ants might make it their home. Sound detection is helpful in finding a carpenter ants infestation. Be vigilant of dry rustling noises, often made by an active colony of ants. Tap on the suspected wood lightly and press your ear to it. The slightest vibration will startle the carpenter ants. You will hear a rustling sound made by ants as they begin to perform random actions. The most efficient way to spot the carpenter ants is to keep an eye out for worker ants in your house. Worker ants can be seen foraging for food. Use a flashlight covered with a piece of red film and follow their trails. If you find one nest, make sure to search for addition satellite colonies nearby. The carpenter ants might be coming from the outside. Keep in mind that carpenter ants travel far in the search for food. If you see them foraging for food in your kitchen, they might be coming from your attic, porch, window sills or they might be coming from the tree in your yard. The type of food carpenter ants is attracted to include sweet food, fats, protein, pet food, and honeydew. The carpenter ants are the most active at night time. In the search for food, they leave their nests fifteen minutes after sundown. Most foraging happens between sunset and midnight. A trick to catch the carpenter ants is to place food around your house to attract the ants. Once the ants come to get the food, you can easily follow their trail. 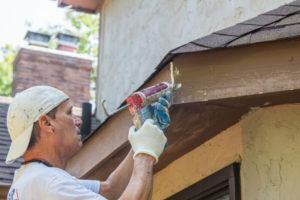 Natural RemediesIf you do not wish to hire professional help or to use commercial remedies, you can try to get rid of carpenter ants in a more natural fashion. However, you should be patient, as these natural remedies take some time to start working. To Prevent Them from Coming InsideTo prevent carpenter ants making themselves at home, you can use several natural ant repellents. All you have to do is sprinkle them around your house, paying special attention to the potential entry points. Lemon juice, for example, can be used both around your house and around the carpenter ants’ nest. It will interact with the chemicals they use to communicate with each other and prevents them from finding their way inside your house. You can also use cinnamon – grounded or the essential oil – to prevent them from coming in. Other useful natural remedies include peppermint, chalk and coffee grounds. All of these remedies are easy to clean up afterwards and some of them will even make your house smell much nicer than before. Make Your Own BaitsYou can also make your own baits that the ants will eat and take inside of their nest. Mix borax and sugar water and then add it to the food of your choice, such as peanut butter, for example. One-part boric acid should be mixed with ten parts sugar water. You can dry the mixture in the form of little pellets and spread them around your house and entry points. You can also make a paste out of it – spread it onto a thin cardboard and air dry it. Separate it into small pieces and spread around the ants’ trails. The sugar in it will attract the ants, while the boric acid will eliminate them once they eat the special cake you have prepared for them. Another combination that can give nice results as well is the baking soda and powdered sugar mixture. Sugar is the element that attracts them, while the baking soda kills them by creating a chemical reaction with the acid they naturally carry in their bodies. Alternatively, you can try using Diatomaceous Earth (DE), as it will dry them out some time upon ingestion. Sprinkle it around your home, but try to keep it dry, as that is the only way it will work. It doesn’t work very fast, but your problems should be resolved in the next two weeks. Cream of wheat and cornmeal will, much like the DE, absorb the moisture from inside of the ants’ bodies. They will then swell up and create a pressure that they cannot survive. These two work much faster than the previous method. DIY Spray RecipesThere are some natural ingredients you can mix together to make your own ant-killer spray or dusting powder. Whichever recipe you choose, it is very important that you continue to re-apply it for some time, until you are certain that it has done the job. A water, vinegar and dish soap solution will act as a repellent but will also kill ants on contact. Use generous amounts around your house, with a special focus on the carpenter ants’ nest. What is even better is that this mixture doubles as an excellent cleaning solution as well, so make sure you make a lot of it. A borax and water combination is another effective solution to your problems as well as a food-grade Diatomaceous Earth (DE), which you spread around the nest. How They Get in Your HouseAs mentioned, wet and damaged wood is the most likely entry point for these ants. However, even if the wood surrounding your home is healthy, they might still make some tunnels in order to get to the food source on the inside. Once they get inside, they spread around the voids in your walls, inside the insulation, or inside the hollow wood elements around the house. Their main nest stays outside, so the moisture levels in the indoor tunnels don’t have to be very high. This allows them to move around freely and nest comfortably around the entire house, even 100 yards away from their primary nest, in some cases. Carpenter ants are very good at hiding and the infestation may go unnoticed for a very long time. They use wood to make tunnels and find a food source, so the damage to your house is slowly building up. Make regular checks to see if some of these creatures may have ended up inside your home. Look for wood shavings and sawdust around wooden areas. Tap gently on wooden surfaces and look for the loud, rattling sounds they will emit when alarmed. If you see some of the adults or find their shed wings inside of your house, don’t wait and get some help immediately. Once you realize you have a problem, it might be too late. That is why prevention is very important. Seal in all openings you might expect them to crawl into and use some repellents to make sure they would wish to stay away from your house to begin with. Fix any water leaks and make sure there is no standing water around your house. Vacuum and dust your house regularly to make sure there are no food residues to attract them. Don’t leave your pet’s food out for too long and always use airtight containers to store your food. If you locate their nest in your garden, use adequate remedies to kill the entire colony. Carpenter ants need a lot of protein in their diet to be able to survive and multiply. Naturally, the proteins come from the dead bugs and small invertebrates they are eating. However, once they find their way inside your house, the choices are many and the feast may begin. A dirty stove, filters, crumbs in your pantries and food residues on the floor are the main things that will feed this army. Another one of their favorite foods is sugar. The natural source for them is honeydew, but your house offers a lot of sugary snacks as well. All they need is to get ahold of some of your sweets, granulated sugar, jelly and maple syrup and they are as happy as they can be. This is why you need to make sure your house is clean and that your food is stored away properly. Be careful with honey jars as well, as these tend to be their main place of gathering. Seal it tight and keep it on a saucer filled with water so that they won’t have a chance of coming in. Carpenter ants, unlike termites, do not eat wood. They just use it to nest and get ahold of all the deliciousness trapped inside of your home. Even if your house is made out of cedar wood, which is notorious for not being very tasty to other wood-eating bugs, you still won’t be able to protect your home from an infestation. On the other hand, they might eat dead termites, as they are an excellent protein source. This carpenter ant bait comes in the form of a gel, placed in a special tube with a syringe applicator. This allows you to easily reach all the nooks and crevices around your home. Also, the product is ready for immediate use. All you have to do is squeeze it out of the tube around the areas where you have found ant trails and nests. The ants will start feeding on it and take it back to their colony. If you are planning to use this gel in vertical surfaces, you should know that it doesn’t stick to anything and will most likely slide to the ground very fast. This product kills ants on the spot. It comes in the form of a powerful sprayer with an extendable wand. You can use it for both indoors and outdoors and it will provide you with up to 9 months of protection against these pests. You can easily adjust the nozzle to the preferred spraying intensity – from stream to spray – to treat all the surfaces where these insects may hide. You can spray it on your porch, around the foundations of your home and all around your house as well. However, this product needs some practice, as the nozzle doesn’t provide a very accurate shot. This is a carpenter ant bait that comes in the form of small, white granules. You can then spread these granules all around your home, garden, shed, garage and other places where you are facing these stubborn pests. Use a bait around areas where you have noticed carpenter ant activity and let them take it back to their colony. Once you figure out the paths they are using, spread the bait once more so that you make sure all of it will end up in their nest. Make sure not to use too much of the product though, as it is very potent. Usually, one teaspoon of it will be more than enough. Also, don’t spread the bait on areas where you expect it to get wet, as it will dissolve before the ants have the chance to grab it. This gel bait comes in a small applicator for a precise and effective indoor and outdoor carpenter ant protection. The formula is developed in such a way that it is exceptionally attractive to ants. As a result, they are eager to collect the bait and take it back to their nest. The active ingredient named Thiamethoxam works fast to get rid of workers, brood and queens. Once it enters the nest, it needs only a few days before it kills the entire colony. The bait is more liquid than gel though and you might also need some effort to squeeze it out of the tube. This product comes in the form of a spray that kills bugs on contact. It even has a residual action of up to six months. On top of killing all kinds of ants, it is also suitable for eliminating some other pests, such as roaches, spiders, silverfish and others. It comes with a relatively long nozzle that allows you to direct the spray with precision and treat even the tightest crevices around your home. With this product, you will be able to treat the satellite indoor colony. However, it has no real effect on the primary colony located somewhere in your yard. Carpenter ants are creatures that can go unnoticed for quite some time. They are most active during the night and can go foraging a long way from home. In this process, they dig holes through your house and cause structural damage. This is not only a money issue, as sometimes great investment is needed for the repairs, but it is also a matter of health and safety for your family. This is why it is very important to check your house for carpenter ants from time to time. You also need to make sure that you apply preventive measures and act as soon as you find out you have a problem. There are many remedies you can use – natural and commercial – and you can always ask for professional help before the situation gets out of hand.